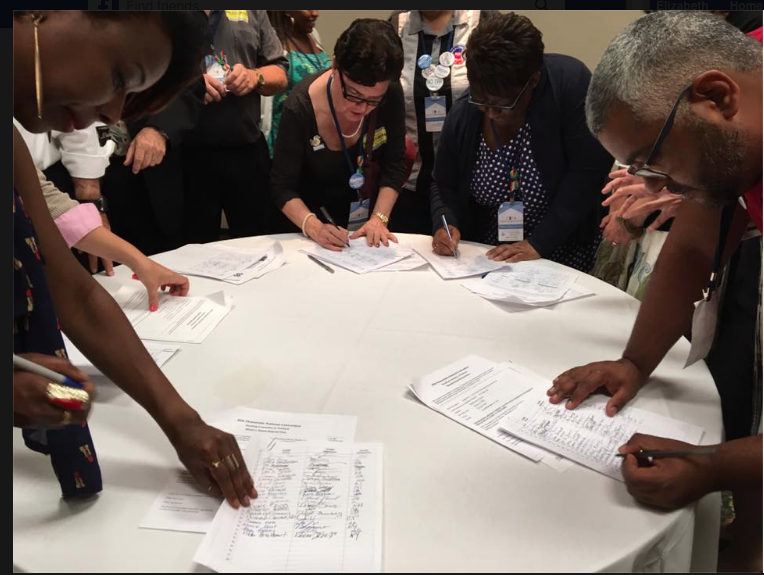 This weekend in Orlando, Florida members of the Platform Committee met to help create the Democratic party's positions on a number of key issues. 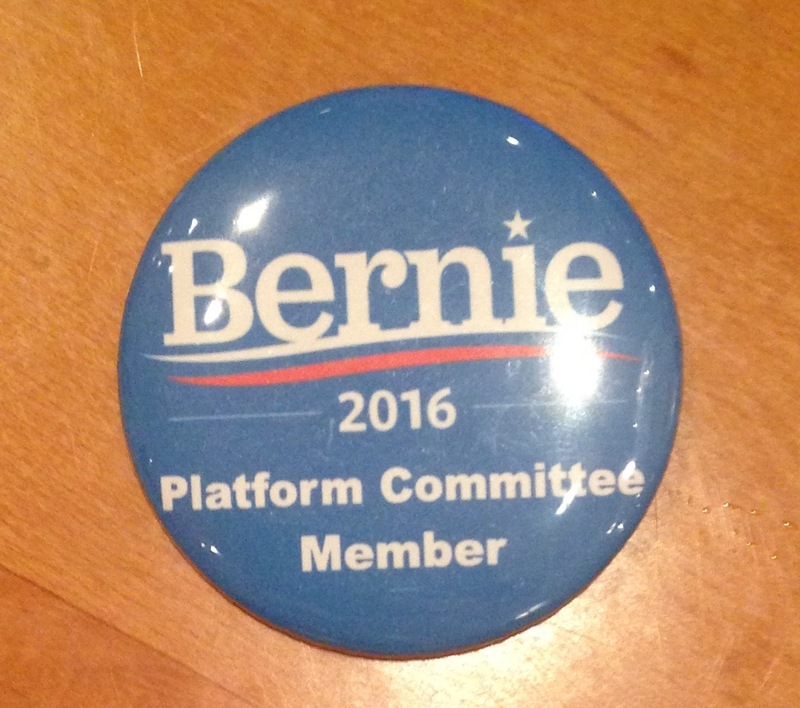 I was honored to attend as a Committee member on behalf of Senator Bernie Sanders. The Platform passed with overwhelming support from members appointed by Secretary Hillary Clinton, the Democratic National Committee (DNC), and Senator Sanders. However, the platform falls short on several key issues, specifically the Trans-Pacific Partnership (also known as TPP or "manure," as Sanders Committee member Jim Hightower dubbed it) and Medicare-for-All. There were amendments offered on TPP by both the Sanders and Clinton camps. Clinton Committee member Lee Saunders, president of AFSCME, took to the mic to support his amendment on TPP, joined by AFT president and Clinton Committee member Randi Weingarten. "We have been against TPP," Weingarten told the audience. "And we are glad that both of our candidates are against TPP." "We have open opposition from both of our candidates," echoed Saunders in his remarks. "For once all Democratic candidates and Labor are of one view: No on TPP." "[Trade agreements] must not undermine democratic decision making through special privileges and private courts for corporations, and trade negotiations must be transparent and inclusive... [W]e will oppose trade agreements that do not support good American jobs, raise wages, and improve our national security... Any trade agreement must protect workers and the environment and not undermine access to critically-needed prescription drugs...These are standards all Democrats believe should be applied to all trade agreements, including the Trans-Pacific Partnership." But what was missing from this amendment of 452 words? Four words that made the position of the Democratic party on TPP explicit: "We oppose the TPP." Former NAACP president Ben Jealous, representing Sanders, offered those words in an amendment to Saunders' amendment, imploring Committee members to be leaders, not bureaucrats. But the Clinton and DNC members of the Platform Committee voted down the Jealous amendment in a vote of 74 to 106. Let me recap for you: Clinton Platform members got up to tell the Committee, guests, and the audience watching at home on CSPAN that they oppose the TPP. But they would not add these words to the platform: "We oppose the TPP." A subsequent amendment was offered by Sanders Committee member Jim Hightower which stated the TPP must not get a vote in Congress. It too was voted down by the Clinton and DNC platform members (77 to 104), despite one of the most stirring and captivating speeches of the weekend, delivered by Dr. Cornel West. On healthcare, the platform language as adopted states that "healthcare is a right, not a privilege" and that "Democrats will never falter in our generations long fight to guarantee health coverage as a fundamental right for every American." This fight is far from over as millions are still without insurance, many are underinsured, and those with insurance still struggle to afford their healthcare expenses. Our system of healthcare is still largely market-based, not rights based. But the DNC and Clinton Committee members refused to support an amendment, presented by Sanders Committee member Michael Lighty of National Nurses United, which stated: "The best way to achieve this goal is through a Medicare-for-All health care system that builds upon the ACA [the Affordable Care Act] and gives everyone in this country the freedom to get the medical care they need when they need it." "If this [single payer] is controversial in this room, it is the only room of Democrats in which it is controversial," Lighty told the Democratic Platform Committee this weekend. Single payer is supported by 58% of US residents and 81% of Democrats. This vote to refuse to endorse Medicare-for-All -- in a 66 to 92 vote -- was, as Dr. West said at the drafting committee meeting, an embrace of the abstract over the specific. While my heart is heavy knowing I will vote for Secretary Clinton in November -- and, yes, I hope you will do the same -- we must cherish and celebrate the victories we have achieved. But we must also examine our defeats, for they are telling for what they say about the current Democratic establishment and Senator Sanders' campaign and the millions of people it mobilized. It is a defining difference - it is the difference between the platitude and the action, between the promise and the execution, between, to borrow Dr. West's phrase, the abstract and the specific. As evidenced from the votes this weekend, we have much more work to do -- in our school boards and in our city councils, in Washington, DC and in our state capitols, in the Democratic party and in the streets. And it is us up to us, my fellow Berniecrats and my allies in the DNC and Clinton camps to transform this party. 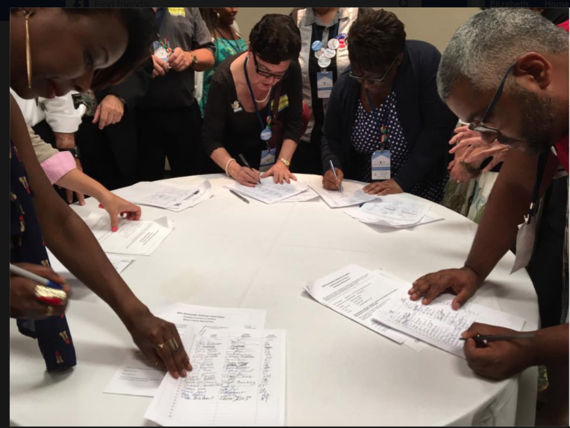 As Senator Nina Turner told those at the platform meeting: "Welcome to the new Democratic Party."